What is bridge funnel? The first thing I want to ask you a question. So, how do you get people who don’t have an existing relationship with you or your partners to come to your website and decide to give you money? Until you can figure that out, you don’t actually have a real business. There are a few things you need to understand before you can convert cold traffic, and then a few simple things you can do to your signup process that will make it work for you. If you read the Dotcom Secrets book on page 118 where Russell Brunson talks about traffic temperature. I’d recommend re-reading that section to get an even better understanding of this concept. Now, we go through some real interest in bridge funnel. Bridge page funnel is when you know you’re sending somebody to your next funnel. But they may not understand some core concepts or things that they need to know. Before you can sell them that product or that service. So what we do is we put up a bridge page ahead of that. The first page of the squeeze page they give you their email address. So you can follow up them then they’re taking this bridge page. On the bridge page basically video where you’re bridging the gap between what they understand, what they need to understand to buy the product of the service on your next funnel. So we bridge the gap here on this page and then we have a link that pushes them into your next funnel. 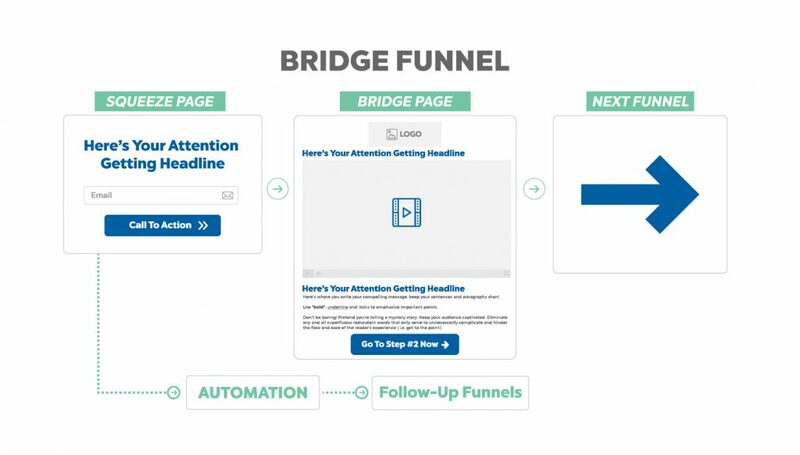 This is how the bridge page funnel works. In short, The purpose of the bridge page is to meet people where they are at and then get them to where they need to be to buy. My first goal is to give them what I promised on the initial page. My second goal is to “bridge” the gap between what I just gave them, and what I’m trying to sell them. How to use Bridge funnel to your business? Author / speaker /coach / consultant… If I was selling to cold traffic who didn’t understand exactly who I am or what I did, I’d get them to opt-in for the main result they desire, and then on the bridge page have a video explaining how they can get that result through what I offer. E-commerce… I’d target ads at people who are trying to solve a certain problem. After they opt-in, I’d do a demo to create a bridge between what they want and how my product can give that to them and then bridge them into my funnel to get a special offer. Business-to-Business… Just like the other industries, I’d see what result they want, and create the bridge funnel to connect what they want with what I have to offer. Network or affiliate marketing… I’d target ads at people who are looking for the result that my Company’s product can give them (like weight loss, or more energy). On the bridge page, I’d show how my product does that and then forward them to the corporate website through my link. Professional services… I’d use this funnel to reach out to cold-traffic who aren’t aware of the industry I’m in or the problem I solve, bridge the gap, and then send them to funnel to make an appointment. Retail / Brick & Mortar Business… I’d use this funnel to bridge the gap between what they want, and how my company can get them there quickly. Step 1: Where on the product awareness continuum they are coming to you from? To understand how to convert cold traffic, you have to first understand where on the product awareness continuum they are coming to you from. Understanding this is the first step to figuring out why you aren’t currently converting cold traffic. Most likely your sales messages (videos, landing pages, webinars, etc…) are very product or solution focused. This is how you have to craft oﬀers to convert to your own (hot) traffic or your partners (warm) traffic. But this approach actually repels cold traffic, because they have no idea what you’re talking about. We have to talk to the cold/mass markets diﬀerently. We have to change our vocabulary and how we talk about our oﬀers. My test to know if I’m speaking to people who are unaware of the problem (the masses) is to ask this question: If I were to walk into a food court at the mall, and make my oﬀer to everyone, would the majority of the people there have any idea what I was talking about? In this step, we’ll take people to a landing page and give away something for FREE. I’ll probably do a whole issue in the future on mini-survey style squeeze pages. And all of the awesome things we’ve learned about them. The mini-survey is very non-threatening and in almost every market we’ve done them in, have had amazing conversions. If you don’t know how to create survey style squeeze page you can read my post about survey funnel or watch the video below. After they opt-in, I email them the link to the free website… but then I take them to what I call a “bridge” page. The “Bridge Page” is a page between the mini-survey squeeze page and the oﬀer page. When they go to the oﬀer page. I will be using industry terms to try to sell them my product. So I need to educate them, and warm them up so they are prepared for the oﬀer they will see on the next page. Second, I explain that. We tell them the reason why they are here and what is the plan they need to do. Third, I say I can show them how to lose weight faster as they think on the next page. See how I bridged the gap in those three sentences? Now when they go to the next page and see a video talking about weight loss product. They have context on what it is, and why they need it. Context is key – without it, they won’t buy. I’ve included the script I used for that bridge page video along with this issue. We no longer sell this product. But it should serve as a guide for you on how you can structure you bridge page videos.